A little taste of spring-type weather has been teasing east Tennessee residents this week. So I can’t help but remember the beautiful spring season at the Tetons last May. The cottonwood trees were tipping out with light green leaves, yet snow was still plentiful on the mountains. Ribbons of clouds hung low in the valley areas during the morning hours, offering up an extra adornment to landscape scenes such as this one. Such a huge difference between the snow covered trees on the mountain slopes and the light and airy cottonwood trees. Love the intricate barn wood pattern and the split rail fence just visible before the row of trees. Nice shot Donna. Most of mine lately were of birds on ice! It's hard to believe places like this really exist...magical shot Donna!! I have been taking note of your compositions, what you include in your shots, and what the eye is drawn too, the balance. Perhaps this is something you could talk about in an "Ask Donna" post? How do you choose the elements to include in a photo? Thank you for the beauty you share with us! That truly is beautiful! I have yet to see any of your photographs that are not frame worthy! The delicate green of early spring trees is so pretty. 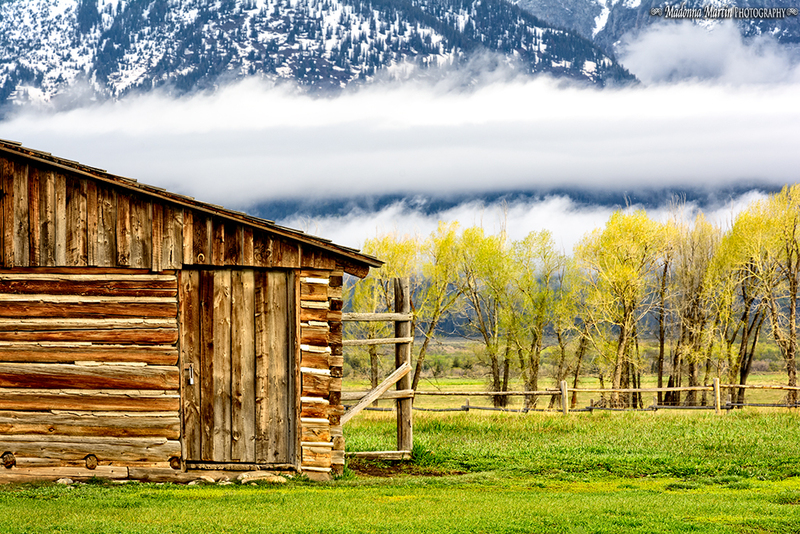 Love the cabin and the low streak of white clouds above the trees. Another wonderful photo.